World No. 1 big wave surfer Makua Rothman may feel that, as he says, his “house is like a suitcase,” but where he lives is on the water and—sometimes—under the water. So even when living life on the road, Rothman does everything with a focus on life on the water. Also an accomplished musician with an album, Rothman, 31, tours for two reasons, sometimes not even knowing he is leaving for an event until just days before the plane takes off. To stay ready, Rothman works with a boxing-based nutritionist and strength and conditioning coach. 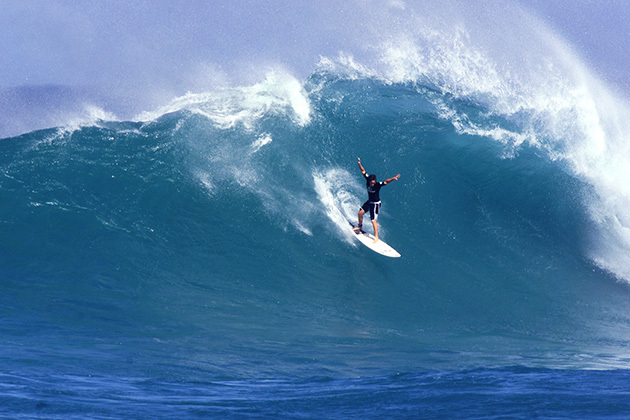 Rothman surfs a wave at the Rip Curl Cup on Sunset Beach in the North Shore of Oahu in November 2000. ​Rothman uses his workout, which he does with surfing legend Laird Hamilton, when he visits Hamilton at his Malibu home. The two push each other—“Laird is half fish,” Rothman marvels—with a specially designed workout that includes one man on the side of the deck hitting weights and the other man in the water, “back in a hole,” working to stay underwater as long as possible while staying in constant motion. “It is pretty gnarly training for surf and turf,” Makua says. “You get a certain amount of breath. In Mother Nature, sometimes you don’t get a breath. You get hit.” With water, weights and breathlessness all around the duo, prepping for life underwater makes Rothman comfortable for those times he wipes out in competition. ​But living on the road is more than working out in a variety of ways. It includes the logistics too. Makua brings up to three boards, between 10 and 11 feet long, per trip, depending on the location. He totes them in a surf bag that exceeds 100 pounds. Rothman wants to vary his board selection, knowing that the decision he makes at home can greatly affect his performance on the water. “You can use the biggest board ever, but if not in the right spot, you are not going to catch the wave,” he says. “I like to ride a board I can maneuver.” With that, he brings a main board and two smaller ones. With so many different trips, often for different reasons, he puts as much as he can in a backpack and has different bags for different tours. “It is real monotonous,” he says about packing. He brings boards, T-shirts, long pants, an inflatable vest, wetsuits and his asthma inhaler to fight his chronic asthma, a condition that almost cost him his dream of surfing. With some tours longer—or colder—than others, he often has to add hoodies, booties and gloves. With a life ever shifting—from his schedule to the waves he rides—the youngest surfer ever to catch the biggest wave in the world, a title he held at age 18, knows that at this stage in his career he must prepare for anything, especially those on-the-road moments under water.